Why don’t we have boomtowns anymore? 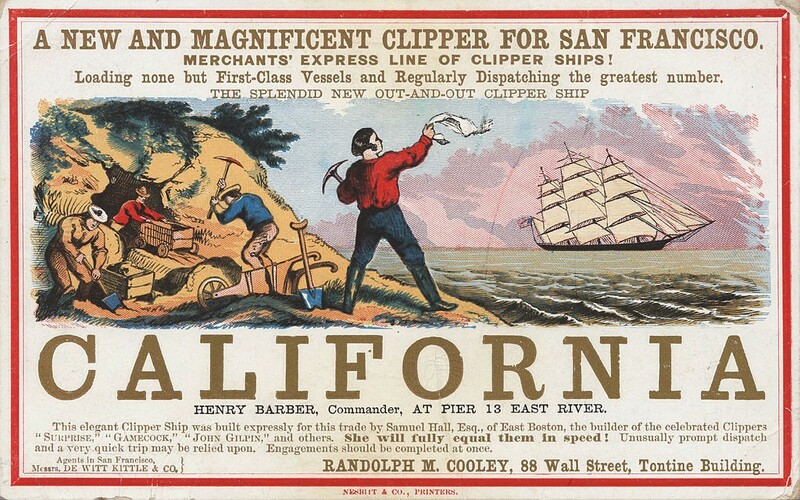 California attracted tens of thousands of gold prospectors during the Gold Rush of 1849. San Francisco’s population quadrupled in size as a result – and the state continued to grow rapidly for almost a century. New Zealand shares a similar ‘boomtown’ history, with rapid growth in the late 1800s and middle of the 20th century. So why did this trend stop? Querying the demise of Boomtowns is an unusual way to advocate for affordable housing reforms, but it is a surprisingly useful way of analysing the global housing crisis. 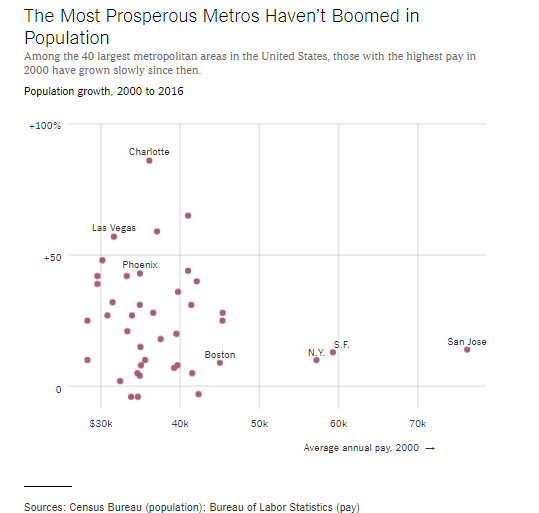 The New York Times has written an article about the disappearance of Boomtown America. It was largely based on the work of David Schleicher, a Professor of Law at Yale Law School, who writes about the regulatory impediments to mobility in the United States. A section of David’s report focuses on land-use restrictions which I have republished as the main bulk of this article. The problem Schleicher highlights is that the cities with the highest incomes are no longer attractive to low and middle income people because the gains of moving to the city are lost in high housing costs. This being a change from the past and has lowered economic growth, productivity and widened inequality. 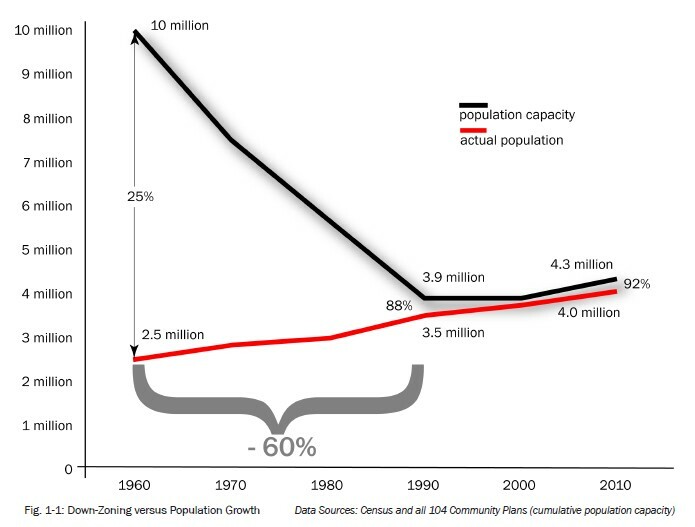 These tightening land-use restrictions from the 1970s to 1990s can be seen in the following graph depicting Los Angeles zoning capacity. New Zealand cities, such as Auckland, have similarly tightened land use restrictions. The recent increase in zoned capacity from Auckland’s Unitary Plan, like Los Angeles is inadequate when compared to expected population growth (see my article on Downsizing Auckland’s Unitary Plan). This restrictive regulatory system as David explains systemically advantages existing residents and makes it difficult for low and middle income earners to successfully enter city markets. This labour market barrier to entry has serious implications, Auckland for instance is no longer attractive to new teachers, due in large part to the high cost of housing. How long can a city last if it cannot attract essential workers like teachers? The inability of prosperous metropolitan areas to inclusively share opportunity and wealth with new residents can be seen in the following graph. Of limits on mobility, the best understood in the legal and economic literatures are land-use regulations. Before the 1970s, land-use restrictions (zoning laws, subdivision regulations, historic preservation, and so on) limited access to some towns or communities, usually rich suburbs. They did not, however, cap housing construction in entire metropolitan regions. Builders could always construct new housing, either in downtowns or on the urban fringe. Something dramatic happened to land-use regulation in the 1970s and 1980s: it became much, much stricter. Importantly, while this phenomenon affected all types of municipalities — from urban downtowns to inner-ring suburbs to exurbs — it only occurred in particular regions of the country. In particular, coastal metropolitan regions like San Francisco, New York, and Boston restricted construction in cities, suburbs, and exurbs. Because these popular regions restricted new housing, demand for living space outpaced supply. Housing prices soared, but population growth did not. In contrast to these coastal regions, Southern and Southwestern metropolitan areas like Houston, Phoenix, and Atlanta continued to impose minimal land-use restrictions. Though demand to live in these regions grew as well, this demand led to increased housing construction and population, rather than substantially higher housing prices. Because the most restrictive regions tend to be the nation’s richest, their lethargic population growth has reduced levels of wealth in the United States as a whole. As previously described, Hsieh and Moretti estimate that GDP would be 8.9% higher if land-use restrictions were reduced in three restrictive regions: Silicon Valley, San Francisco, and New York. And once again, because barriers to mobility reduce the capture of information spillovers, land-use restrictions may indirectly impede growth as well. This is no small effect. Thomas Piketty famously argued that increasing returns to capital relative to economic growth are a major driver of economic inequality. But Matthew Rognile and others have found that nearly all of the increased returns to capital in Piketty’s work came from housing capital: “The long-term increase in capital’s net share of income in large developed countries has consisted entirely of housing.” This is a stark and important finding: Piketty’s result about capital is almost exclusively about real estate. Why? The most important reason is land-use restrictions. Today’s rentiers have something in common with the classic rentiers of old — they are landowners, but instead of deriving income from owning arable soil that can produce income when farmed, they own access to valuable labor markets, which increases either their own income or produces rental income. Today’s rentiers then use zoning to ensure, and increase through monopolization, the value of their rents. These restrictions create income disparities not only between individuals, but also between states and regions. As discussed above, Ganong and Shoag have shown that from 1870 to 1970, states’ per-capita GDPs were converging. People would leave poor states like Mississippi to move to richer ones like Connecticut. But starting in the 1970s, the combined effect of land-use restrictions in many of the richest metropolitan areas stopped that convergence in its tracks. Though doctors, lawyers, and other high-skilled individuals who could afford the higher housing costs could still move to capture higher wages in richer, restrictive states, less-skilled workers could not. Notably, although the GDP gap between richer and poorer states is now static, convergence continues to this day within the set of states with less-restrictive land-use regulations. To me the failure to share opportunity and wealth with newcomers makes me think the American Dream and Kiwi Dream are failing to deliver. This is a serious loss which may be contributing to the radicalisation of politics and to the rise of populists such as Donald Trump and Brexit (see my report, Housing affordability: Reform or Revolution). Tony Blair’s Institute for Global Change has made a similar point in recent videos, podcasts and reports with regard to UK’s housing situation. Another UK housing advocacy group London YIMBY has a report called “Yes In My Backyard -How To End The Housing Crisis, Boost The Economy And Win More Votes”, which argues for a relaxation of building restrictions within London on a street by street basis. In Toronto, Canada Housing Matters was founded in mid 2017 with a simple mission: to advocate for land use rules that would allow for more homes in more neighbourhoods. In 2018 its aim is to scale up its advocacy efforts. In the former boomtown of San Francisco, some people are proposing to use robots to keep homeless people out of cities! What happened to its famous wild west, freewheeling, gold prospecting, boom towning, land of opportunity popular culture? On a more positive note some Californian politicians and pro housing advocates have a plan which would dramatically increase the amount of housing which could be constructed in the state. My personal opinion regarding land-use regulatory reform is to look at Tokyo as a model, due to its combination of good mobility, housing affordability and small environmental footprint. For example, homelessness is significantly better in Japan than in New Zealand. Ultimately, like in the past, it is political will that is needed to break the regulatory logjam. The Financial Times has written that New Zealand’s new government’s “proposals to tackle the homeless crisis could make the nation a global test case”. Around the world progressive housing policy work is making advances and a head of steam is developing. Where the policy implementing steam will be successfully released cannot be predicted. But the pressure is such that reform is inevitable. New Zealand’s new government has made a strong start with its housing, transport and urban planning reform announcements. Success though will be determined by whether New Zealand can sustain this degree of political will. Great article which I simplify as the Boomtown carrot may still be orange, it is withered and tasteless. On the other hand social security that is geographically agnostic means the stick has no bite. Travel around New Zealand and you see places like Port Craig that died totally once it’s economic base died in the early 1930s. Versus other places in NZ whose economic base has declined more recently where people are not forced to leave to follow work. I’m not saying this is a good or bad thing, but another factor that flattens boom-bust cycles. “systemically advantages existing residents” – that depends on your point of view doesn’t it? As an existing resident (and existing landowner) I feel I would be more advantaged economically by a rapidly growing city. I would also prefer more vibrancy. I think density restrictions are not the only thing stopping boom towns. There are plenty of other things to put you off like the building code, watercare, developer contributions, resource management act, licensed tradies, limited supply of tradies, cowboy builders, overpriced materials mandated by BRANZ, etc. In the old days, building a house was as simple as buying some land and employing a builder. Is there any reason it needs to be more complex than that? You obviously agree with me – our over the top building code and consenting system didn’t even stop leaky houses or pay out to have them fixed. People bought new houses without bothering to have them checked assuming the council had done so. I would prefer an optional system of private insurance. The insurer would do whatever inspections they need and then take on the risk of major defects for say 20 years. They would have much better risk assessment than the council who seem obsessed by stupid details and documentation but barely look at the structural and water-tightness components. They would encourage builders to use proven materials and techniques through their fee structure. Cowboy builders would find it difficult to get insurance. Why anyone thinks a local authority are the best option for providing risk based insurance is beyond me. Why anyone thinks that private insurance is a good way of keeping costs down is beyond me! Even if it cost $30k (which I highly doubt), I reckon it would be cheaper. And it would actually provide a guarantee instead of finger pointing. I imagine it could easily cost that much over the lifetime of the home if an insurance company is taking on all of those risks. Totally agree with you. For the last decade my council has been defending itself ‘on behalf of ratepayers with dry homes (which includes me)’ against other ratepayers with leaky homes. The only winner are lawyers and building repair businesses. Of course the insurance companies have to be insured too – can’t have them going bust. The council can step in when one or more homeowners cannot afford to take the insurer to court – even the most honest and well meaning of insurance companies will need legal test cases to decide some classes of claim. Given that most of the leaky homes were built after the building code was gutted, it sounds like our over the top system is doing a much better job than a lax system did! One potential solution is to make it a criminal issue. Some builders near my partners old house got reported for ripping insulation out of one house after getting the pre-line inspection done and them putting it in the next house. They got fined, but if the company dissolves they can’t be fined. The tradies, managers, and owners should be criminally responsible (it’s fraud after all). It amazes me just how cheap some people can be. Removing the insulation would have taken time. Reusing it would have taken more time than using new stuff. I am sure it saved them some money but it can’t have been much. I suspect most people would want a house they built to be certified by someone official even if it was not a legal requirement. Also I doubt insurance companies would have much interest in a house if it did not have some form of certification. I can’t imagine there would be too much difference if you removed the need for regulation and certification. I think you need to build a house to realise just how over the top the paper work, delays, cost, and number of inspections are. And at the end I doubt you will feel 100% satisfied that your house is good, because the council are mainly interested in making sure they can’t be blamed rather than making sure it is done right. Personally I don’t think ‘what most people want’ should be mandated by law. If I want to build a house on my own property, why should I need it to be inspected by council? If I rent it out, that would be different. But I think all rentals should be subject to minimum standards and inspections, regardless of whether the property is new. I agree there is an unnecessary amount of red tap, however I’m not convinced involving the insurance industry is the way to reduce that. Even if you removed a significant amount of regulation, there would still need to be some regulation for impacts that go beyond the boundary of the property such as fire safety. That homeless statistic is COMPLETELY false, and I’m sick of seeing it being used by people who don’t do research into their sources. The measurement for homelessness in NZ is fundamentally different from that used in other countries. 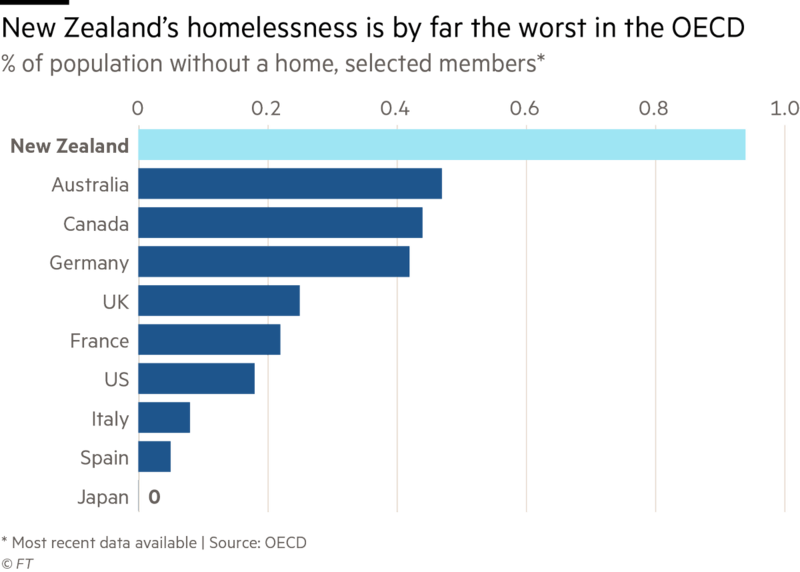 Anyone visiting the US, for example, can clearly see that their homelessness problem is currently an order of magnitude worse than anything NZ has ever seen. What sources do you base this on. I’m not asking to be contrary but to understand a potentially different viewpoint. “Anyone visiting the US, for example, can clearly see that their homelessness problem is currently an order of magnitude worse than anything NZ has ever seen” – Maybe that only applies in the big cities? There is plenty of small town USA where houses and rents are dirt cheap, that isn’t really the case in NZ. How is the measurement different? I think the NZ measurement is quite reasonable, although I believe it also picks up people who are staying in a motel while moving between homes. However, it does differ from other jurisdictions which makes comparison difficult. The measurement may not be different but the denominator might be. I imagine most homelessness occurs in the bigger and more successful cities. If the US has more people living in smaller cities and towns than us it would come out smelling like roses even if their big cities are anything but. I only wish there WAS a radicalisation of politics. Trump and Brexit are not radical movements but reactionary/ultra-conservative movements, seeking to halt current progress and to turn the clock back if at all possible. P. Bright and L. Prager are the local examples of this trend – thankfully they’re still marginal, if annoying. But the confusion between radical and reactionary movements is leading to a filthy kind of “red-brown” politics, where radicals are allying with these reactionary movements on the grounds of them being “anti-neoliberal”. Why has nobody commented on Japan. I have never been there and have no Japanese friends but it does seem like a civilised culture we can learn from. Hi Bob, I can only comment from my own visit to Japan a year or so ago- and there were people obviously sleeping in the street in Tokyo – around Shinjuku Station and underpasses we saw quite a lot. Thanks for the info Vinny. Sounds as if comparing stats from different countries is like comparing oranges with lemons. I really didn’t expect a genuine utopia especially since the only contact with Japan is ownership of cars and an uncle who survived being a Japanese POW (Thai railroad). The first step is to get rid of heritage controls. If some people like heritage then they can band together and buy a couple of villas and set them up as small museums. The rest of the villas should be put on trucks and sent to new greenfields areas on the periphery. In their place we should have apartment buildings and four storey walk-ups. I believe Hamilton has a heritage area that is made up of 1950 and 1960s former state houses that are protected. I guess they wanted to get in on the bandwagon too. +1, either that, or pick a single street of the best conserved ones and disallow any changes to the exterior. Protect that heritage properly rather than the ridiculous situation we have now were every villa has to stay but you can basically modify it however you want. I’ve always thought Heritage NZ should be mandated to buy non-publicly owned buildings if they want to include them on their heritage schedule – that should give us a good idea as to how much they actually value it. I also wish council would stop with blanket heritage controls – heritage just means anything old. They should be limited to only identifying heritage buildings/ areas with ‘historic’ value as set out within the RMA. Weren’t those heritage controls gone with the new Unitary Plan? Or more accurately, replaced by the single house zoning. I don’t think it was ever really about “heritage”. Seriously, what’s the reason to have this belt of single house zoning in the inner suburbs? Gotta keep the housing ponzi inflated somehow. I am not sure Boomtowns are anything to desire. They occur when there is a mad dash to exploit natural resources. Whether it is gold towns, mill towns or oil towns the theme is the same. Use up the resources before someone else does. but, but, they’re great for growth. Progress, you know? For further information on housing supply issues read my Top 10 housing links for the beginning of 2018. This will explain that the housing crisis is a tax on labour mobility and that the Auckland Council economists have a weak argument for defending land-use restrictions. You can also find out what other cities are doing in response to their housing crises and how some cities have avoided having a housing crisis.